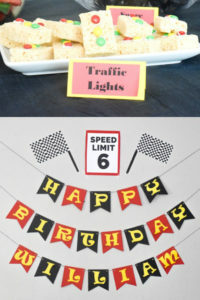 Put together a fun and festive monster truck birthday party for the special kid in your life! We show you how to make festive food, fun homemade decorations, and easy party favors! I was glad to switch up the theme and got my creative juices flowing. Of course, I browsed Pinterest for ideas and started making a list of everything I wanted to do for his birthday. My main goal was to make a styled table & wall dedicated to the monster truck birthday party theme (like this ballerina birthday party I threw for his sister). 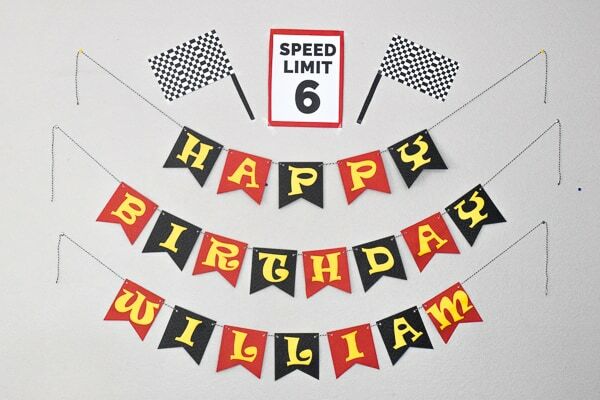 I used my trusty Cricut Maker to make the birthday banner – playing on the Blaze theme with red, black, and yellow. 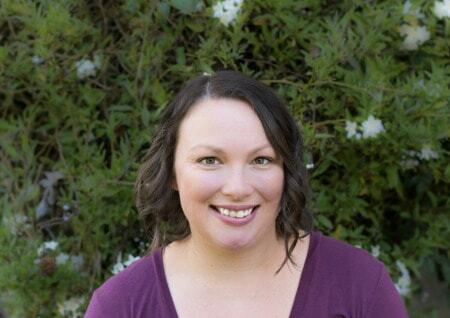 Next, I made a Speed Limit 6 Sign in Canva. I printed it out on white cardstock and backed that with red cardstock. I used my Cricut to cut out checkered flags but it could easily be done by hand. The handles of the checkered flags are the same black cardstock I used for the birthday banner. It’s textured and reminded me of tires – so fun. 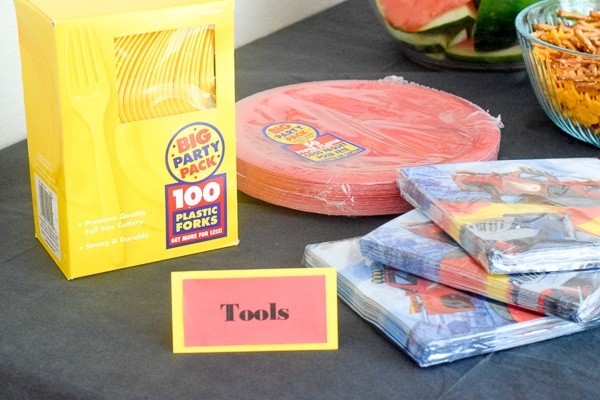 The food table was decorated with a black tablecloth, red plates, and Blaze themed napkins. Once the wall decorations were hung, I set out to customize the food to match our monster truck birthday party. 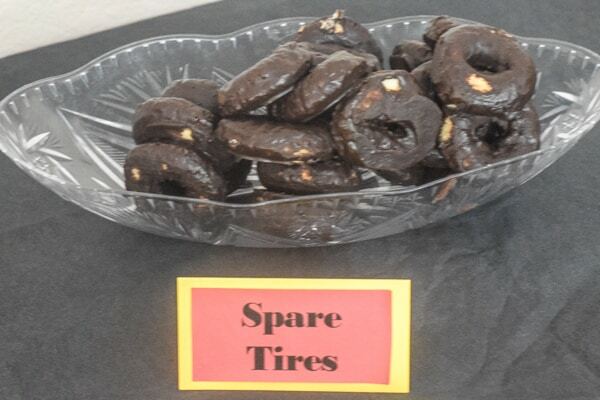 First thing I got was chocolate donuts to be used as Spare Tires. 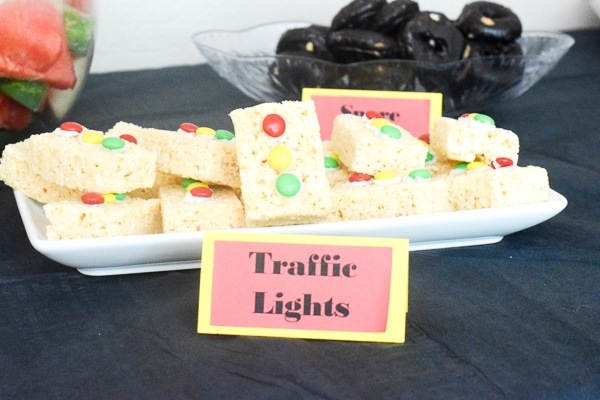 I made Stop Lights out of Rice Krispie Treats and M&Ms – they were a big hit! I also made Nuts ‘N Bolts out of fish crackers and pretzels. 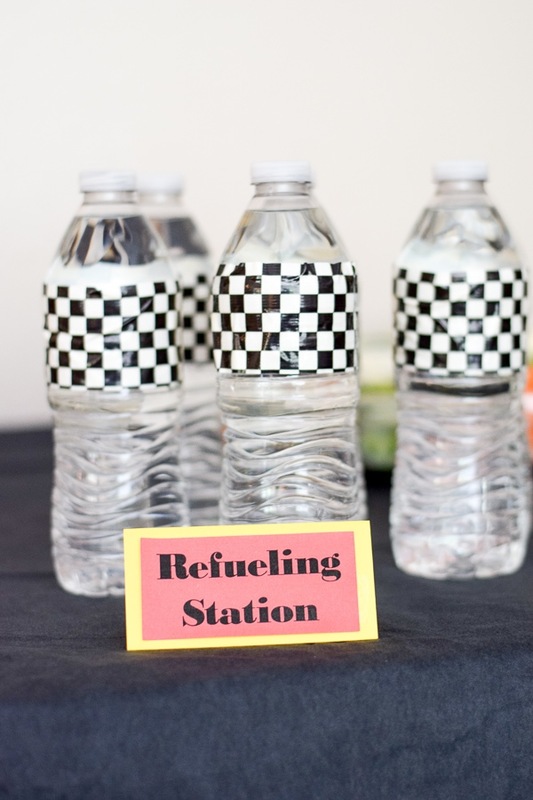 Our refueling station was kept simple with water bottles decorated with checkered Duck Tape. I love how much it tied in the theme without being too time-consuming. All of the little food labels were made of yellow cardstock cut into squares and folded into a tent. The labels were made using the print-then-cut feature in Cricut Design Space. I ordered William this Blaze and The Monster Machines shirt from Amazon. I had originally planned to make him a shirt but ran out of time because we were camping two weekends in a row leading up to his birthday. He was so happy to have this fun t-shirt, so it didn’t really matter. Our main activity was a bounce house. The company we used, Solano Jumps just so happened to have a monster truck banner, so it worked out perfectly. 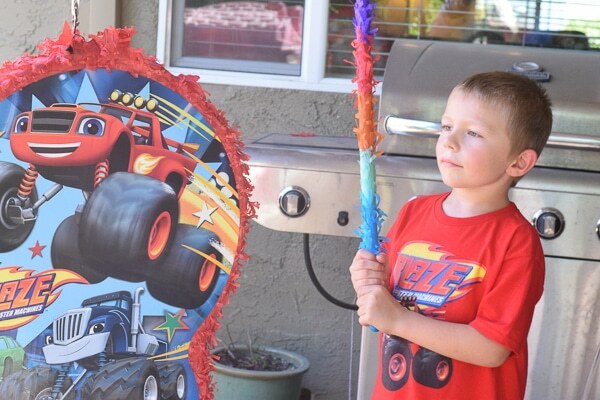 The kids also celebrated with a blaze and the monster machines pinata filled with candy. 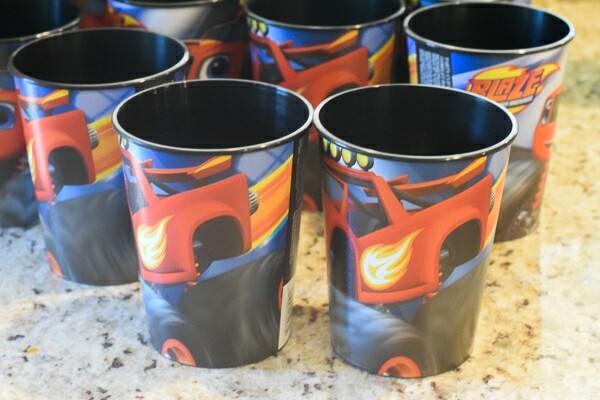 I kept the monster truck party favors simple with Blaze and The Monster Machine cups. We filled them with a couple of little toys and called it a day. I figured they were already getting plenty of sugar from the birthday cake and the pinata, so candy was not needed. No one seemed to mind. 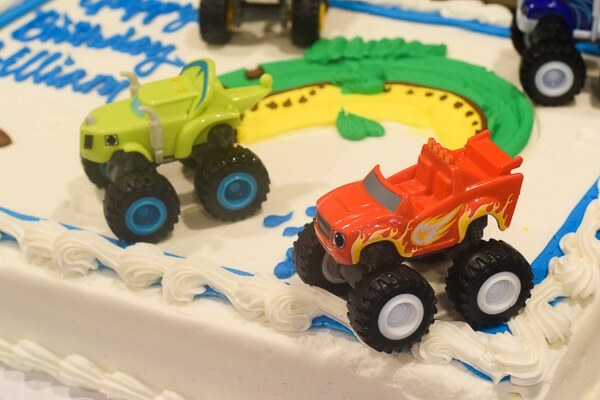 We had so much fun celebrating our newly minted 6-year-old with this monster truck birthday party. I hope you enjoy celebrating your little one, too!